In June of this year I introduced the relationship between the S&P and its key moving averages (20-, 50-, and 200-day MAs). At the time the greatest number of matches were made to the pre-crash scenario of 2001 with a similar match to the 2003 meltdown. The conclusion at the time was to wait for a break of the 200-day MA before fully investing long, but to expect declines of between 7% and 30%. A significant bull market has a good chance of emerging from the quagmire - remember markets lead economic news. So where do we stand with respect to these two articles? Since the June piece the S&P went on to lose 34% to its October lows and from the time of the October article the S&P lost 20% to the low it made 4 days later. 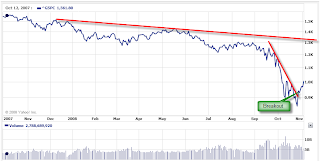 The market followed the October 10th low with a brief rally which eventually lost steam and kicked off the retest move. This second decline was to make new lows for the Nasdaq and Nasdaq 100, but for the Dow and S&P the October 10th low held as a second (higher) low was posted two weeks later. Given the S&P has pushed someway from its second low after 6 days of modest gains, gains which were sufficient to break through the 20-day MA, where does the S&P (and likely global markets as a whole) stand now? Back to the historic data. As of Tuesday's close the S&P finished 6.4% above its 20-day MA, 9.27% below its 50-day MA and a mind-numbing 26.8% below its 200-day MA. Where in the past have similar matches occured? 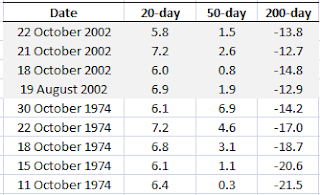 Surprsingly, only two periods emerge; October 1974 and October 2002. Telling that both matches occurred in October, although neither coincided with a Presidential election. 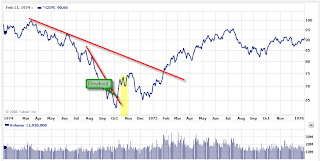 Looking at the S&P for 1974 there was a break of sharply declining resistance similar to what occurred recently, but the 1974 bounce quickly faded into a more prolonged backtest of lows until the start of December. It was only after that test that the market was able to push higher. Will this be the Obama unwind? The 2002 alternative is very similar in structure to the 1974 scenario with the eventual backtest taking just over 4 months as opposed to the month in 1974. 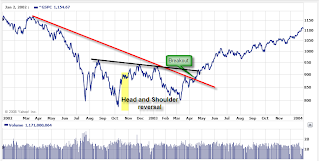 We could see a reversal head-and-shoulder pattern take shape as happened in 2002 (if so the neckline will be at 1,005 which means the development of the right-hand-shoulder will begin today). The closing low of October 27th at 848 should be the reaction low for the bottom and not be violated (even if the absolute low occurred on October 10th). Intraday penetrations are acceptable. The worst looks to be behind us but we won't really know until we see what happens when the 200-day MA comes into range; a solid cut through and it will be up and away; however, a negative response to the 200-day MA test could produce a 1932/2002 style scenario in 2009 bringing with it another big step lower. If there is a silver lining to the worst case scenario it's that the current picture suggests we have already reached the extremes of the 2002 capitulation and not the pseudo-capitulation generated after the September 11th attacks. 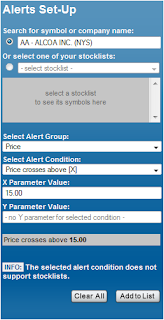 Set a second price alert for a cross below a price set just above the closing price of the early October low. For example, on October 10th Alcoa closed at $11.25. If we add 1% to this and set an alert to trigger when this price is breached it will warn us when the right-hand-shoulder is approaching completion; in this instance the alert would be set for a Price cross below $11.36. There is a new Sheriff in town. It's time to look towards the future and put the past behind us - because the market will.